A fellow examiner emailed me asking if I could write an EnScript that could be used to quickly export all the existing files in the evidence based just on their file extensions. This would typically be used for eDiscovery type cases. 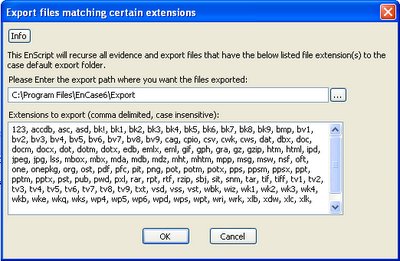 An index.csv file is made that contains a listing of every file that was exported along with its original path in the evidence and the exported filename. A unique number is appended to each exported file to ensure uniqueness and to avoid one file with the same name as another from overwriting it. Hey Lance, hope all is well....! Cool idea, thanks for putting it together, and as always, thanks for sharing. 2. What is your approach towards carved files? You first run this script and only then (if necessary, requested) set-up the carving for specific filetypes and export them as search hits into a separate folder? Thank you again for the script - I will check it as soon as I can. 1-it will create a folder(folder name=image file name, exclude E01 extension) for every image files under Export Folder. 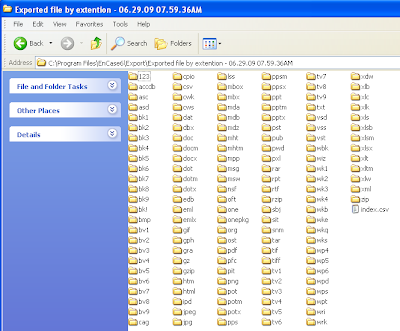 2-it will create subfolders( a some file extension named folder ) every created folders. it will do same again every image files (image2,...image40). 3-it will copy doc extension files to doc subfolder, xls files to xls folder etc. i tried do this but i couldnt solved completely. i edit a Encase built-in script below. ** i couldnt copy files every subfolders. i am waiting your helps. Thanx. Hi Lance, any possibility of getting the source code for the EnScript to Export files by extensions? I'd like to make some specific modifications to my version of your code, but cannot do that without the actual EnScript. If you do not feel comfortable in provide the source code, I will understand completely. This is a very handy tool. We use it here in the Netherlands(Hague Police Force) to quickly extract files, we then put in a tool called Forensic Websearch. This tool gives a tactical investigator the possibility to search in digital evidence from a location outside our office. Is it possible that we (like the collegue above) can obtain the source code from you, so we can make some (minor) modifications to suit our purposes?